Fresh Air: Art from the Bernheim Arboretum and Research Forest at the Ascent Private Capital Management building was curated by Elizabeth Leach of Elizabeth Leach Gallery in Portland Oregon, with direction from Martha Slaughter, Bernheim’s Visual Arts Coordinator. It presents works by current and past artists in residence at the Bernheim Arboretum, a 14,378-acre nature preserve in Kentucky, in addition to other regional artists, working with printmaking, photography, sculpture and landscape painting. The Bernheim Arboretum’s overriding mission is to “explore [our] deep connections with nature.” This is not trite lip service to faddish “eco-tourism” or to the type of environmentalism that considers nature as a separate entity that one looks upon as a subject. Bernheim, and the Fresh Air show, embodies Shakespeare’s obvious but overlooked concept that “we are nature too.” This is an easy fact to recognize but a tremendously difficult one to internalize with one’s entire being. So difficult that (I would argue) it’s the source, and such internalization is the underlying purpose, of just about every major spiritual tradition in the world (and I realize the implications of that claim). It’s one of the many ideas that transcends the limitations of language, and as such requires something like art to help us sort it all out. And Fresh Air provides that help, which is all it can provide. The rest is up to the viewer. In a certain formal sense, Shinji Turner-Yamamoto’s wall hung Constellaria series are sculptures that are also landscapes. They’re made almost entirely of materials from the land – fossils, clay, animal glue, tree resin. Rather than representing land through paint, perspective, or color, Turner-Yamamoto presents the actuality of it, the textural conretia, the “thinginess” of life. He grows his own crystals using water-soluble minerals on supports of acetate and plaster, allowing them to emerge from the vertical surface in a way that embraces randomness but is subtly balanced and graceful. The work achieves a certain structure without stricture, which, incidentally, could be a definition for elegance. He allows rain, wind, gravity and light to shape his sculpture and inform compositions, along with his own reflections on nature, his chosen medium (refreshing the tired dictum that the medium is the message). Shinji Turner-Yamamoto , Constellaria #1, 2014. Ca. 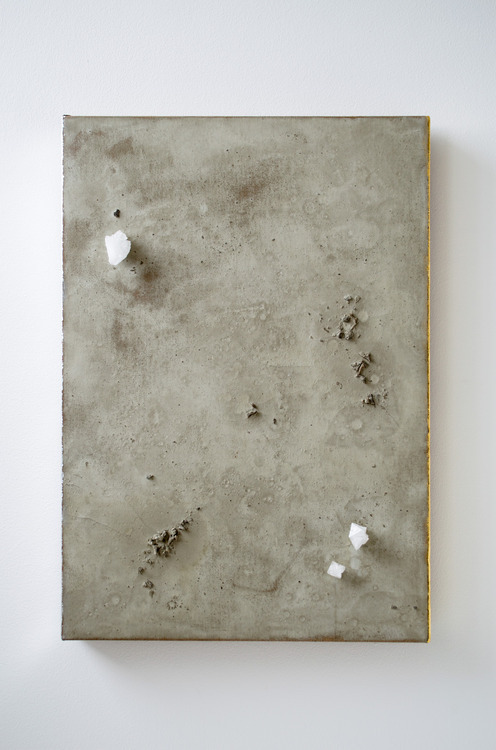 450-million-year-old Ordovician fossil fragments/powder, cultured crystals, 24kt gold leaf, silver leaf, gesso, clay bole, animal glue, tree resin, raw linen canvas, wood panel, 28.3 x 19.7 x 3 in. Photo credit: Shinji Turner-Yamamoto. His aim, as I see it, is for his sculpture ultimately to bridge that pervasive “lack” in our lives by providing connections with nature, which really is to say with everything. He says, “when we are conscious about the existence of these infinite connections [between mankind and nature], we emerge from our anthropocentric view of life and move into a holistic view. In doing so, we are free from the limitations of death.” This is admittedly a rather lofty goal, potentially blasé in a contemporary art world that values irony over authenticity and, in a nihilistic fit, has displaced art from utopias. But Turner-Yamamoto’s project is far from the bombastic utopian visions of early 20th century modernist “artists/prophets” like Kandinsky and scores of others. Turner-Yamamoto is more detached, perhaps in the Zen Buddhist sense (a point I hesitate to even bring up because of its overuse), leaving it to the viewer to figure it all out for him or herself, or not. Much like, say, a Rinzai Zen master giving a student a koan, perhaps a few seemingly nonsensical words, a slap in the face, and then going on about his business. Turner-Yamamoto’s detachment is very different, and infinitely more authentic, than the haute hipness of the so-called “new casualist” or “provisionalists” “memes” that are transparently a case of trying too hard not to care, much like an adolescent. Turner-Yamamoto isn’t alone in his steadfast commitment to the power of natural materials to make profound statements. 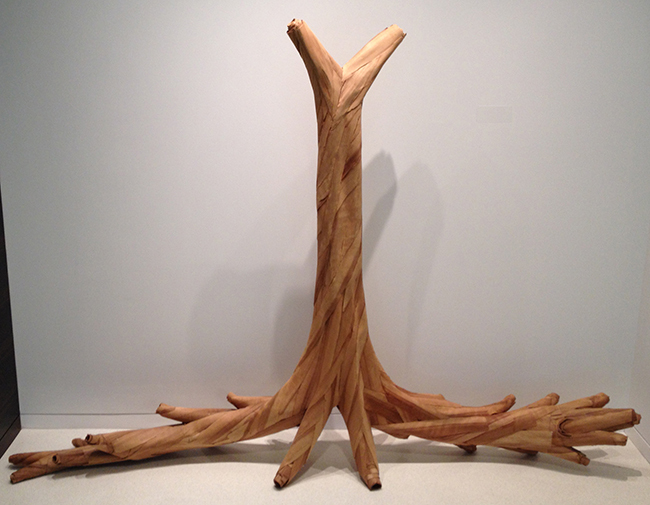 Barbara Cooper meticulously glues together layers of wood veneer to construct forms resembling the material from which the wood veneer came, such as, in the case of Rhiza and Untitled, a large tree with protruding roots. It’s apparent her sculptures take time to create and in this realization we ponder the nature of time, growth and change. Mei-ling Hom creates straw domes inoculated with oyster mushroom spores. Unfortunately, the piece at Fresh Air wasn’t innoculated, but I appreciate the potential for an interesting reflection on the combination of aesthetics, agriculture, and culinary arts, perhaps questioning those dualities. 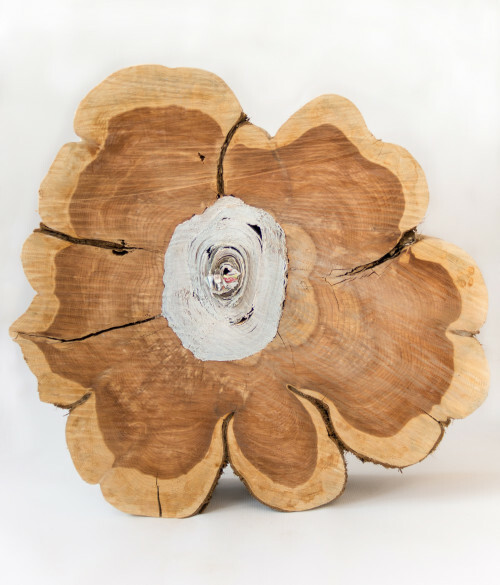 In Forest Echo I and Forest Echo II, Heike Endemann hollowed out the cross section of a uniquely furrowed red cedar log and placed compressed, rolled newspaper in the center (recalling somewhat humorously Ezra Pound’s idea that “art is news that stays news”). The chainsaw marks from the cut are left rough, the bark allowed to crumble and fall where it will, leaving traces of tree fiber, the stuff from which newspaper is made. These gestures of minimal intervention are purposeful and disciplined. The red cedar smells as cedar does: grandfather’s closet, a well-crafted chest, or, more cerebrally, gin, which is distilled from red cedar’s close cousin, juniper. Endemann’s work isn’t just about post-minimalist purity and hand-made formalism. It functions on numerous levels. First, and for me least interestingly, it is environmental: placing the paper, made by man from the very stuff that it replaces, at the center of a hollowed tree questions our intervention into and relationship with nature. That’s a tired theme traversing the banal and over-trodden surface of sociological, cultural and environmental issues oversaturating contemporary art. But Endemann aims much higher, and delves much deeper. She uses a chainsaw to carve the wood, likely an intentional reference to the folk art of chainsaw carving in her native Germany, where, so the reader may know, the world cup of chainsaw carving is appropriately held. Like George Baselitz, she uses the expressionistic surface created by a chainsaw as a metaphor, perhaps in reference to her country’s brutal history and dark mythologies. She also uses the chainsaw to question the nebulous intersection of art and craft. I once heard LA based artist Thomas Houseago quip “try going to Yale to tell them you’re doing wood carving”, which he has in fact done, also with a chainsaw. Like her contemporaries Martin Puryear, David Nash, and maybe even Houseago, Endemann is using wood to question these false dualities between officially sanctioned art –the best barometer of which, as far as I can tell, is whether it’s made by someone with an MFA – and folk art or craft (Endemann has a PhD in Biology, but no university art training). Most interestingly, Endemann’s work raises ontological and epistemological questions. The title Forest Echo I and II, as well as the formal components of the work, invokes the familiar question: if a tree falls in a forest with no one around to hear it, does it make a sound? What about the infinite echo from the fall? Endemann doesn’t try to answer these questions because her art isn’t about answers, but about positing ideas via aesthetics that transcend language and expand our perceptions of reality. Of course the solipsistic response that nothing exists outside one’s own perception is a seemingly close-minded response fit for an inclusive mind. But however hard one may try, one can’t prove it untrue using the increasingly blunt edge of western reason and logic. 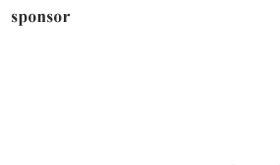 This logic is, in part, the written word, represented by the paper in the Forest Echo series. This brings us, as truth tends to do, to an impasse. To a holding of two contradictory ideas that are simultaneously true. The essence of good art is the ability to synthesize contradictory ideas into an aesthetic that transcends the linguistic limitations of those ideas, which Endemann does with an understated eloquence and quiet purpose. Fresh Air also includes photography, painting and printmaking. Todd Smith climbed majestically large trees at night in the Bernheim Arboretum wearing a brightly colored lightsuit while his collaborator, Natalie Biesel, used long exposures to photograph the movement of his body. The brightly colored ghostlike traces chart the artist in time and space, playfully going up and down these monster trees, reflections on a deeply rooted seismic energy; the playful yet powerful elan vital of the forest. Nori Hall takes black and white photos of idyllic, romantic landscapes, scans them as digital files and adds her own color. This is an interesting comment on what was there, and then wasn’t, and then was again, particularly in a world where nature is disappearing at the hands of so called “civilization.” Nori Hall suggests that there is hope. Nocholas Dowgwillo makes woodcut prints with no preconceived subject or composition in an almost stream of conscious continuous line, relinquishing control in favor of something else – chaos, a deeper order, nature itself? David Sharpe’s watercolors are similarly intuitive, but with a sophisticated palette of bold colors that somehow don’t seem so bold when placed together. This, I suppose, could be one definition of harmony, and his paintings are harmonious. Laura Von Rosk’s subject in her paintings of trees and vistas isn’t so much the landscape as memory, nostalgia (in a good way) and melancholy. In short, the Portuguese concept of suadade. 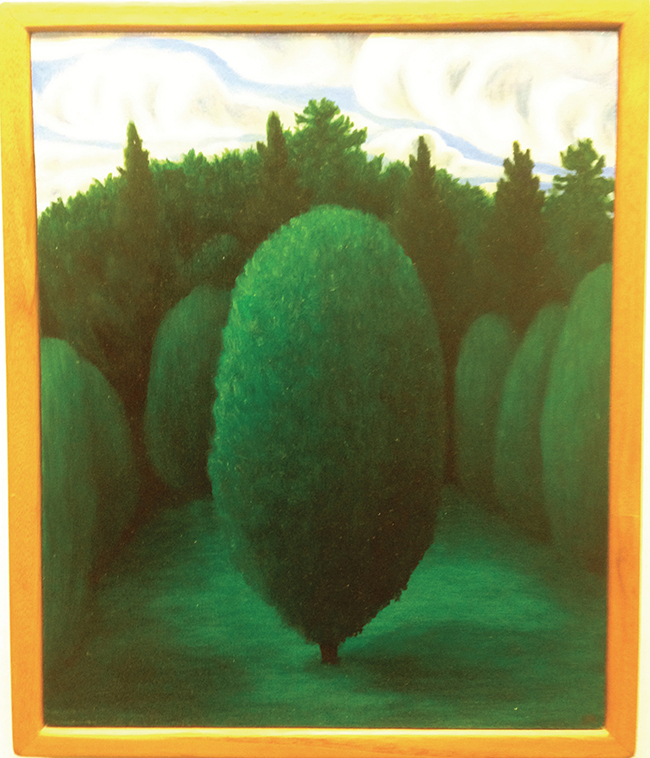 In Bushes at Bernheim, her use of green shows a keen sense of the weight of that difficult color. It also shows an appreciation for subtlety that comes about only by those rare people who are actually paying attention to the world around them in a rather profound way. Without this technical skill and subtlety, these paintings would be hackneyed and overly sentimental, which they are not.